I want to challenge you to step out on faith and start that organization that is on your heart, launch your blog, write your book, start your fashion design company, become a makeup artist, or whatever it is that you feel like you are supposed to do with your life. Will you always have the answers? NO, but once you step out God will direct your steps and lead you. Each day that you say I’ll do it tomorrow, I’ll do it next week, I’ll start next year is time gone that you can never get back. The time to start is RIGHT NOW. No one knows when their last day on earth will be, so it’s truly time to take full advantage of the blessing called life that God has given you. I am not saying quit your job today but if you feel you are supposed to be an entrepreneur or whatever you desire to be, you must take the first step and start building your business, brand, design school or whatever else on the side while you work your 9-5. Eventually God will expand your territory and you won’t have to work the 9-5 if that is His plans for your life, but until then you have to do what you have to do. SO on your off days, work on your brand. Instead of spending hours on social media, “work on your brand”. Instead of sitting at a lunch table with a bunch of gossiping coworkers, go to your car or a place alone and “work on you brand”. It takes time to grow a business,organization, or whatever you feel led to do, but you must get serious about it and start now. My entire life as an adult has been a trial and error process. I call it my “faith walk”. Life has not always been easy. I have encountered days that I wanted to give up, but I remind myself that I only have one life and I MUST make the most of it. I don’t want to grow old angry because I never tried anything outside of my comfort zone. I have stepped out of my comfort zone soo many times. Does it always go as I planned in my head? “HECK NO” Haha but I don’t let that stop me. I learn from the bumps in the road and I keep it moving. Do I ever feel fear? “UMM YES”, but I tell my feelings to hush and I step out on faith anyway. I have learned that unless I try I will never know, if something was the right decision or not. We learn through making mistakes and having a few failures. Don’t allow the fear of “What if it doesn’t work out? stop you”? SO WHAT if it doesn’t work out? At least you tried, you learned from it, and now you can take what you learned for the next experience. 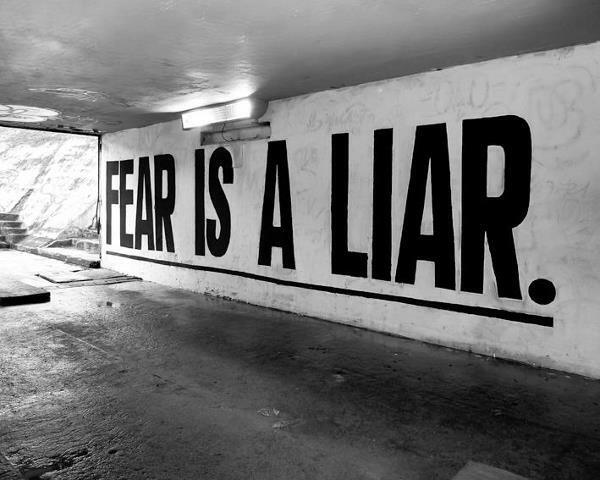 Fear is nothing but a lie inside your head trying to stop you. You must fight back and do it even when you feel afraid. If it wasn’t for me pushing through my fears and trusting God’s will, I wouldn’t be able to encourage you today. I wouldn’t have started the BeAHealthNutToo brand. I wouldn’t have moved from Michigan to LA. I wouldn’t have ever started public speaking. I wouldn’t have created recipe eBooks and I can go on and on. I can’t tell you all how many times I have been afraid but decided to try anyway and many times it worked in my favor. If I can tuck my fears away and go after the journey God has placed before me, YOU CAN TOO! Start today living a fearless life, and every time those negative thoughts pop up in your mind shut them down. Meditate on the following scriptures and speak life even in the midst of storms. I will not worry. I will pray and allow God to lead me. He has a plan for my life and is with me! ** Im SOO Excited ☆The 5 Day Raw Food Detox☆ Recipe Ebook is now available! WOOHOO! Use code “Health” for 15% off. ** I will be announcing the first LIVE Raw Food class date soon. Cant wait! ** You can now watch weekly inspirational videos + raw food tutorials on my youtube channel. Link is about at the top of website. as mr. stanley would say ‘obey God and leave all the consequences to Him’. thanks for sharing! very encouraging!!! I am so inspired by your journey.Great blog post!!! I needed this today.